For more than 500 years scholars have been wrestling with an ancient Roman puzzle that would test even the most cunning of quiz-masters. How do you put together a giant stone jigsaw when 80% of the pieces are missing and you have even lost the lid? Now with a joint Italian-US team on the case using a hi-tech approach the answer might finally be within reach. The Forma Urbis, or Severan Marble Plan, is a giant map of the city of Rome constructed around AD200 by the Emperor Septimus Severus. It was fixed onto the wall of the Templum Pacis (Temple of Peace) in the heart of the city - a massive display symbolising both the greatness of the city, and the emperor's power to know its every nook and cranny. But with the decline of the empire from the 4th Century, the vast marble map - measuring 18m by 13m (59 feet by 43 feet) and intricately carved onto 250 separate slabs - was prised off the wall. 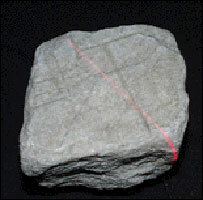 The building stones were stolen, crushed into cement or merely slid down off the wall to lie buried in the gardens below for the next 1,000 years. The rediscovery of some of the pieces during the Renaissance ignited an interest in reconstructing the map that has bewitched scholars ever since. Now scientists at America's Stanford University have joined Italian archaeologists in the capital's Museum of Roman Civilisation with a multi-disciplinary and hi-tech approach to solving the ancient riddle. The Stanford team has digitally scanned all 1,186 surviving pieces of the Plan and constructed a range of computer programmes which use algorithms to try to fit the pieces together. 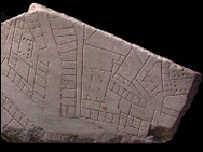 Helping them in their detective work are a set of clues embedded within the pieces - the shape of the broken edges, the colour and veining of the marble, the carvings of the map itself and also a series of holes on the reverse of the pieces, where the slabs were fixed to the wall by evenly-spaced metal pins. It is an intriguing cocktail of three-dimensional clues - but the rewards are equally intoxicating. "We used all the clues to no success for the first two-three years, then we started to get the first computer matches," says Stanford's Professor Marc Levoy. "But when we verified them in Rome it was just amazing to physically touch the real pieces." In the past year, the project has found as many matches as scholars have found in the past 20 years. And in the last few weeks they have completed 3-D models for all the existing fragments: a monumental achievement and a major leap forward to reconstructing the forgotten landscape of ancient Rome. Rich and poor, traders and bureaucrats, slaves and the free often lived cheek-by-jowl in the most multicultural and vibrant city of its age. Its reconstruction after almost 2,000 years is a possibility that excites Professor Andrew Wallis Hadrill, director of the British School in Rome. "Rome has always been a very cosmopolitan place and you can see this in the detail of the Forma Urbis: there's simply nowhere else like it. "It was the first duty of the emperor to know who was in his city, where they lived, how on earth to feed them to keep them from rioting. So this map is a symbolical statement in both size and magnificence. It says: we know you in detail, we know every street, every doorway. What a wonderful way to display knowledge! It's saying, 'This is our city - look at it! Wow!'" The map is also invaluable for revealing the hidden side of Rome which never stood the test of time - the commonplace houses and shops where ordinary Romans lived their lives. Although frustratingly it only gives details of the ground floors for a city that would have had the New York skyline of its day, it is still the most important topographical work to have survived to modern times. Now the veil is being drawn back from the real story of Rome - a buzzing, noisy, often smelly and crowded but living city, beautifully captured in stone. 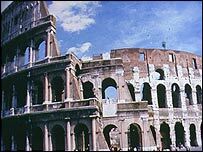 Rebuilding Rome can be heard on BBC Radio 4 on Wednesday 27 July 2005 at 1100BST or for seven days after that at Radio 4's Listen again page.